We have a male Skimmia x Confusa, “Kew Green” shrub (I think). In order to find this out, I had to do a plant-match (which involves searching online and through books, looking at and comparing lots of skimmia pictures) and this was the closest match I could see. I very much recommend one for almost any garden. Skimmia produces berries, like holly, but there needs to be both male and female shrubs to do this. When I knew a little less about gardening than I do now, I always wondered why there were so many flowers on our shrub, yet it produced no seed that I could see. This skimmia is evergreen with glossy, deep-green leaves and when it flowers in the spring, it produces the most heady sweet smell. The fragrance is very strong, each of the thousands of small flowers pumps out an incredible, utterly delicious scent. I really can’t describe it. It wafts through the garden on still days and I just want to bury my head in the shrub and sniff. 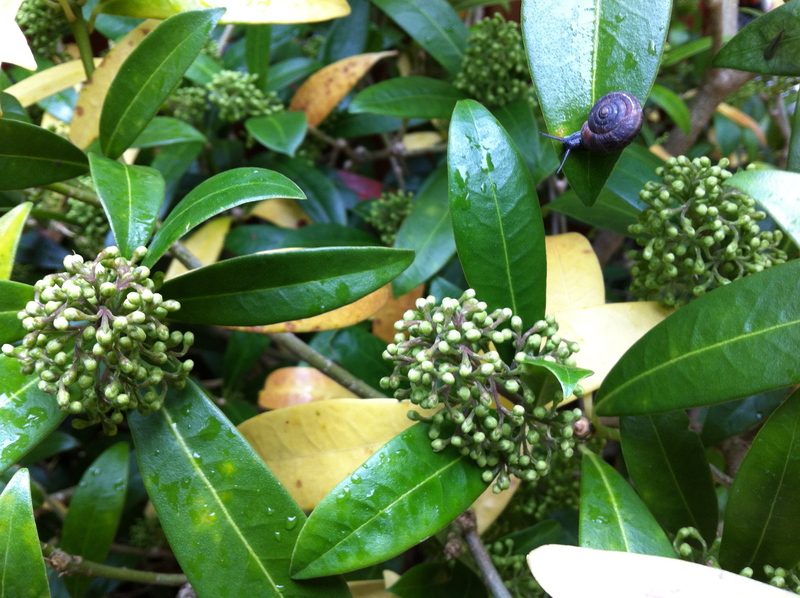 Our skimmia has now formed the flower buds for the following spring. I think of the plant as a perfume factory and right now, the tiny flower heads are being filled up with it.